“I am a gamecock farmer (cockfighter)” – B.L. Cozad Jr.
B.L. Cozad Jr. claims that he had helped many cockfighters in many states thru his compiled court cases and legal arguments. B.L. Cozad Jr. announced in the past his intention to run for an elected office in Oklahoma. B.L. Cozad Jr. is also appealing to the Oklahoma Legislature for the repeal of cockfighting ban. Read also B.L. Cozad Jr. Letter to the United Nations Human Rights Council dated 15 November 2010. As I’ve written about the lack of strong penalties in Alabama for illegal cockfighting, I’ve often asked for justification of this so-called “sport.” Today, I received a letter from a man in Oklahoma, laying out his justification. I am a gamecock farmer. I am also a single parent with full custody of my 10 year old daughter who has not missed a day of school in 3 years, she is a straight A student and her lowest grade on her last report card is a 98. I am retired from the US Army and a disabled veteran and I am a Christian. Now that you know something about who I am let me educate you on other facts. Quite obviously you are ignorant of the gamecock harvest industry and have been indoctrinated into believing the lies of Wayne Pacelle and the never-ending false propaganda of the well-funded Humane Society of the United States. I own and possess gamecocks for the only purpose you can which is to harvest. The method of harvest of gamecocks has been allowing them to fight another gamecock for more than 3,000 years, the majority of our founding fathers like George Washington and Andrew Jackson harvested their gamecocks by fighting them on what is now the White House lawn. I have been attending cockfights since I was 14 years old and I have never seen a prostitute or drugs at a cockfight. I have only seen one fistfight at a cockfight and that was between two men fighting over a girl that wasn’t even at the gamecock harvest facility that day but during friendly discussion they found that each of them were dating her and didn’t know the other one was, which quickly escalated into a fistfight. Every raid by government agents creates situations where the agents may hurt, cripple and even kill people no matter what the issue is that the “law” is meant to address. What you advocate is that these government agents should make raids, rip families apart and create these situations where gamecock farmers may be killed because your personal opinion of chickens outweighs the right of these farmers to harvest their livestock, earn a living and provide for their families. God gave man dominion over the earth, animals, fish and fowl, our Constitution is written to ensure each man is equal in these God given rights, to advocate as you do that the God given rights of the gamecock farmer can be taken away over your personal desire to protect chickens amounts to paganism and animal worship as you have personally chosen to put animals (chickens) above the lives of the gamecock farmers across Alabama. I truly feel sorry for you. The legislature of Alabama passed the first anti-agenda 21 bill in America but maybe you are not aware of what UN Agenda 21 actually is and what you are advocating in support of. UN Agenda 21 = The Pagan’s bible. Alabamans must come to understand that our common fight is actually biblical in nature our God-given rights (Constitution) versus satanic animal worshiping paganism (UN Agenda 21). When will the Republicans who profess to be “defenders of the Constitution” repeal the unconstitutional law criminalizing the gamecock harvest industry and tell the Pagan animal worshipers of the Humane Society of the United States to take their Pagan bible “the UN Agenda 21 Charter” and get out of our state? The UN Agenda 21 Charter is their earth and animal worshiping pagan bible. Understand that animal welfare laws are the same thing that Adolf Hitler used in the early days of Nazi Germany to destroy property rights, seize fascist control of the entire nation and establish the ideology that animals and human lives were equal that were later used to justify euthanizing humans. History does repeat itself if you don’t know history. 1. Maurice Strong is/was a senior board member and advisor of the Humane Society of the United States. 2. Maurice Strong is the co-founder of UN Agenda 21 a plan to move nature, animals, fish and fowl above human lives. Gro Brundtland the other co-founder is the Vice-President of the World Socialist Party intent on forcing socialism/communism worldwide. 3. Maurice Strong is a long time high ranking member of the “new age” movement. The “new agers” are a Satanist cult that practices paganism and worships animals. According to Lawyer Constance Cumbey, Maurice is a very prominent member of the New Age pagan animal worshiping satanic cult. You can listen to her statement at the 38:30 mark of this video. Are you sitting by letting our Constitution be destroyed by apathy and intolerance directed toward fellow Alabamans simply because they are a minority from the rural areas that are involved in an animal agriculture industry you have no honest knowledge of and no interest in? The unconstitutional cockfighting laws are the foundation of the communist/Pagan UN Agenda 21 plan. The animal welfare act and all of the animal welfare/animal cruelty laws are tied to the UN Agenda 21 plan and the Satanist cult new age movement which is based on paganism and animal worship. Please learn what you are truly supporting and choose wisely which side you are truly on because right now you have chosen the side of the Satanic animal worshiping pagan cult. I truly hope that you have chosen that side out of ignorance, and the truth in my words above will enlighten you with the truth so that you may correct your mistake; I would truly hate to think that you would actually advocate and promote the pagan ideology meant to put chickens above human lives if were fully aware of the truth. “My people are destroyed for lack of knowledge” and “the truth shall set you free” seem to come to mind here. U.S. Army ret SFC B.L. Cozad Jr. So, what do you think? Does Mr. Cozad succeed in justifying this industry? B.L. Cozad Jr., who is a gamecock farmer and participates in cockfights, put forth his defense of the industry in a letter this week. Mr. Cozad was responding to an earlier column on animal fighting. The letter drew plenty of comments, both in support of and opposition to Mr. Cozad, who lives in Oklahoma — where cockfighting is a felony offense. Mr. Cozad himself appears in the comments, engaging readers with his viewpoints, some of them involving an elaborate United Nations conspiracy. While I don’t agree with Mr. Cozad or his industry, the man speaks passionately about his views, blending religion and personal rights as justification. But one of his arguments to support cockfighting is that our first president, George Washington, participated. Washington also owned slaves in the 1700s, so that’s hardly a justification for cockfighting in 2014. Hopefully, we’ve grown as a people to the point where being cruel to animals simply for sport is not accepted behavior. It shouldn’t be. Besides, cockfighting is illegal in every state. As it should be. The problem in Alabama is our penalties are so weak, it’s difficult for law enforcement to justify the time and expense it takes to build a successful case. We’re keeping an eye on a cockfighting case in Covington County where instead of being charged under the cockfighting statute, the suspects were charged under the state’s enhanced animal cruelty statute. What happens with that case may guide law enforcement agencies in future such cases. Too, the federal farm bill signed by President Barack Obama last week makes it a federal crime to attend any animal fighting event or to take a minor up to 16 years old to an animal fight. Mr. Cozad said this: “God created man in his own image and gave man a soul that he did not give any other living thing he created. God placed the natural instincts in the gamecock to fight to the death just as he placed the same instinct of fighting to the death in the Beta fish (Chinese fighting fish). . . . Gamefowl owners simply attempt to perpetuate, admire and honor the courage that god placed in the gamecock. We are not vile people and this is not cruelty, we have simply built an industry and a method of harvest around the natural instinct God placed into the gamefowl. Just as the cattle rancher and race horse owners have built industries around the genetic traits God placed in their livestock.” Read all of Mr. Cozad’s comments here. It’s certainly not illegal for Mr. Cozad to defend what he believes in, but it is illegal to fight gamecocks and other animals for sport. And for a reason: It’s cruel. No amount of justification will make it right. I do appreciate Mr. Cozad for his response. But Mr. Cozad didn’t convince me or many others who view animal fighting as just plain wrong. What do you think? Buried deep within the federal farm bill (starting on page 911 of the 949-page act) that was signed into law by President Barack Obama last week is a surprise for those who, for whatever reason, participate in animal fighting. Actually, there are a lot of reasons — bad reasons — people pit dogs against each other in a fighting ring or put on cockfighting derbies: gambling is probably No. 1. There’s always the money. But there’s often side activities involved as well — anything from exchanging and using illegal drugs to prostitution. And there’s the plain old blood lust some people have; they get a thrill watching animals maul each other. Very sad. Alabama has one of the best dog fighting laws in the nation, and that’s good. 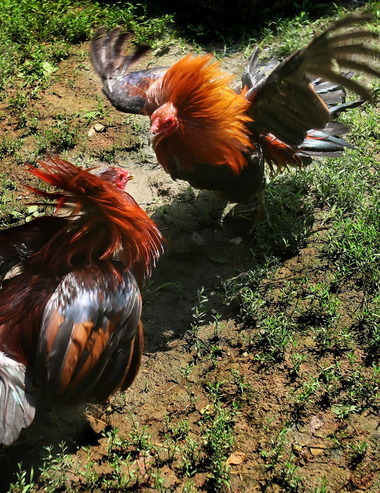 But the Legislature for years has failed to add meaningful penalties to discourage cockfighting, and there’s a lot of cockfighting in Alabama. Cockfighting has been illegal in Alabama practically forever. But the maximum fine is $50. That is hardly a deterrent for an activity where tens of thousands of dollars or more are in play. But now, there are real penalties under the farm bill. Attending an animal fight can get somebody one year in jail and up to a $100,000 fine. It’s even stronger if a person takes a minor up to 16 years old to an animal fight: Up to three years in prison and up to a $250,000 fine. That’s important. It makes the penalties worth enforcing for law enforcement, considering the resources that often must be used to crack down on these cruel, illegal activities where children are often present. The investigations usually take a long time and must use undercover officers and informants. “The Farm Bill gives us a new hammer in breaking up dogfighting and cockfighting rings, allowing law enforcement to crack down on the entire cast of characters involved in these sickening enterprises,” said Wayne Pacelle, president and CEO of the Humane Society of the United States. Now, it’s time for Alabama to get its laws in line with the feds or, at the very least, increase the penalties for cockfighting so that law enforcement, both state and federal, can be assured that when they break up one of these illegal rings, there will be serious consequences for those involved. Do you agree with federal penalties for people who are convicted of attending and participating in animal fights?